Villa Buoninsegna is a big agricultural property with 320 hectares and a few apartments (in self-catering accomodation) and rooms in B&B accomodation for spending a pleasant green holiday, in the very heart of Tuscany, just 27 km from Siena.Our most important cultivations are vineyards and olive-trees: our Super Tuscan Red Wines and our Olive Oil, from organic agriculture, are sold directly on the property. A wide Mediterranean forest surrounds the whole estate, where we grow also corn and sunflowers. 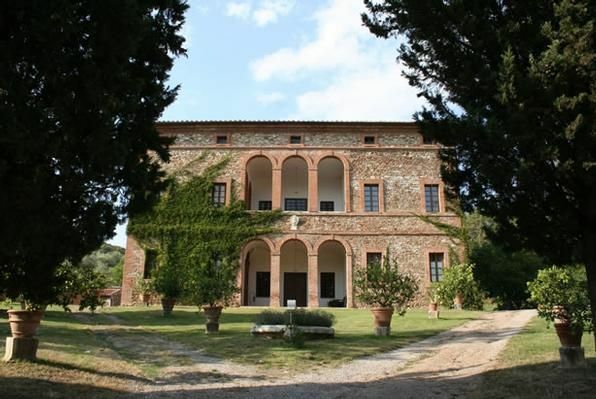 The property is named after the big XVII century Noble Villa, with a typical and noble structure, built in the centre of the "borgo". The apartments for "agriturismo" are placed exactly in the "borgo", where some of the houses were totally renewed in 1999/2002/2004: altogether 5 apartments for max. 20 guests (self catering accomodation), and 6 double rooms in B&B accomodation. The apartment Colombaia 2301 consists of: Small apartment totally renewed in 1999.It is composed by a bedroom (with a double bed), bathroom (with the shower), a spacious kitchen/living and a large terrace with table and chairs; TV Sat.There are some antique furnitures. Safe, hairdryer. - Electricity: once per object according to consumption (Mandatory). - Pet: once per object Costs amounting to 25 EUR (optional). - Climatisation / Ventilators: per object and week Costs amounting to 30 EUR (optional). Pet (once per object, Costs amounting to 25 EUR).